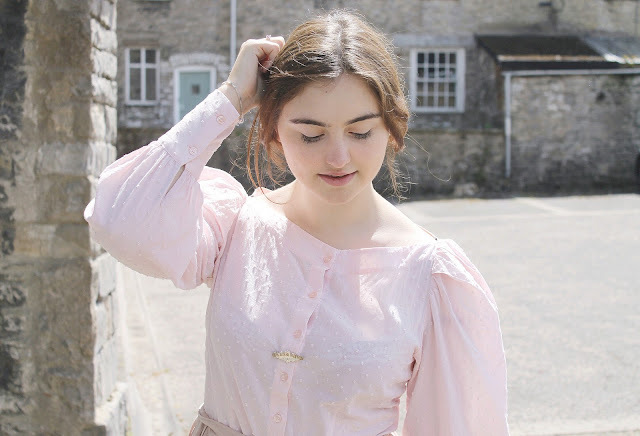 19th century attire but when drawing inspiration from historical dress it is hard to find that balance between outfit and costume, without sliding in to pantomime territory or donning wedding or occasion gear! 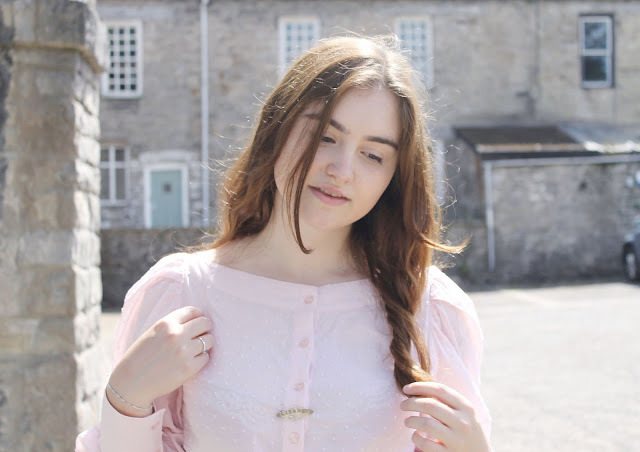 I feel there is a scale of how 'vintage' I am willing to go, how far I'll commit to the look and even little details, buttoned sleeves, raised shoulders, hair combs, can bring great charm to a modern outfit. I'm still learning how to achieve a balance. I feel that this is a little more 'out there' than I'm used to wearing, but I absolutely loved it! 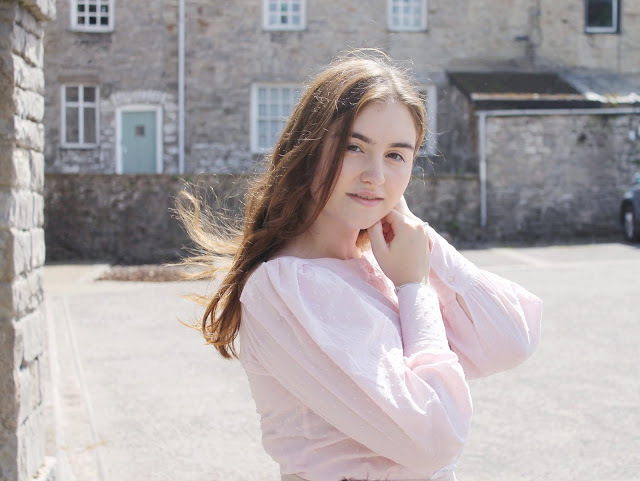 This is a blouse I have been longing to show you for so long, from H&M and in the sale right now. When I saw it, the neckline, the sleeves instantly reminded me of the pink gown Jenna wears in the ITV Victoria episode, The King Over Water, that is set in Scotland. It's super light, breathable, perfect for everyday wear. The skirt is thrifted and only £2 and I also managed to find an underskirt for £2 so it billows out a little. I'm still on the hunt for a striped or button down number but this one holds a nice shape. My outfits are ever evolving! The poofy sleeves own this outfit, I feel like I just get away with moving this look in to modern times. 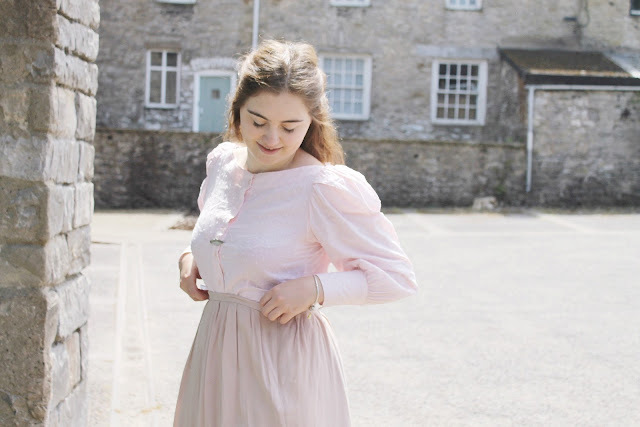 Although I have opted for a long skirt this time to emulate the traditional silhouette, to tone it down a little this blouse also accords quite splendidly with a skater skirt or some other relatively modern contraption. It is so versatile! 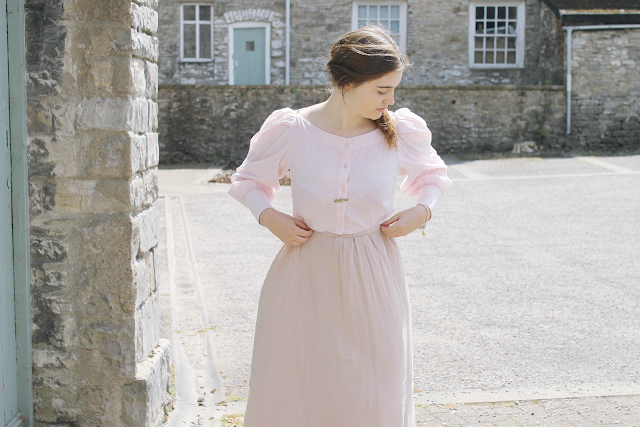 We went for a backdrop of the pretty regency style houses in town for these photos. Luckily it is a public place and quite an arty area, right next door is the Abbott Hall art gallery and mini attached museum, so I hoped that we might blend in to the setting. I love those windows. We had toilets nearby too, plus a cafe! We share a name, the writing inscribed says 'Elizabeth'. I think it's so cool to be able to share a name with the previous owners and wearers of this brooch. My mum found this for me one Christmas years ago, it dates from 1913 from Birmingham. I love being able to wear it after all this time, as much in fashion as it was then. I received lots of looks from passers by whilst wearing this outfit, even from across the park! I feel that it is much more 'out there' than my usual compilations, but it is so funny because it is only a top and skirt, there is nothing different about it compared to modern day styles! I hadn't realised how similar we like to dress, up and down the streets, how particular the dress code in our modern society without us even knowing. Very cute outfit and the colors too! So pretty! I love the pink! 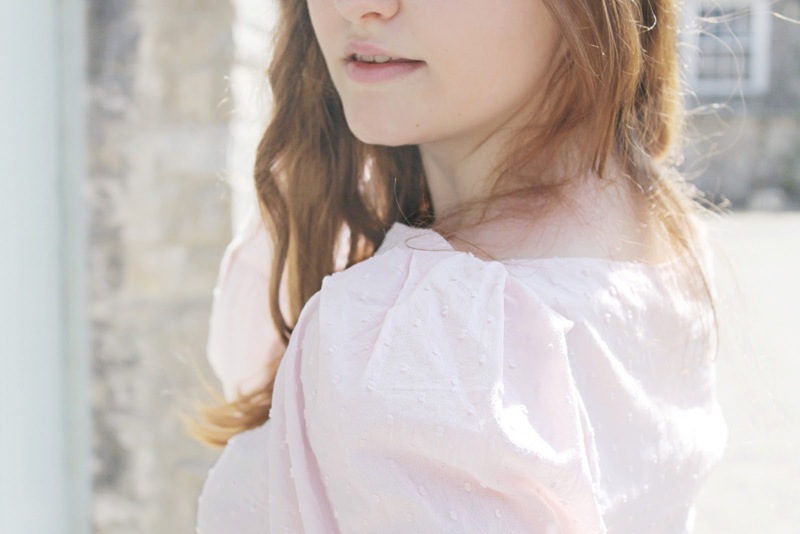 This is the most lovely blog post, your photographs are stunning! Love this outfit! You could modernise it even more with a pair of Converse! This is such a look! I love the TV show so much, you look super elegant! I've just started watching the tv show Victoria and love it! !